One of the nice things about being a sports fishing journalist is the fishing trips that lodges and corporate sponsors ask me to take. (It's a tough job fishing for a living, but someone has to make the sacrifice.) Recently I was asked to travel to Port Alberni on Vancouver Island to sample the hospitality of Jack's River Lodge at the confluence of the Stamp and Sproat Rivers. Though the lodge is so new it hasn't yet opened, I suggest that corporate group clients make tracks quickly - space will not last long. This is a high-end facility built directly above the most productive salmon and steelhead pools on the system. You can sit in the hottub and watch the salmon swim by. And some of them are huge - the Robertson Creek chinook, for example, exceed 50 pounds. Phone 1-250-724-3337 for information; 1-800-313-9955 for reservations. Nick Hnennyj (rhymes with penny) is the lodge's chief guide. I spent most of my youth fishing a small Brautiganesque creek south of Calgary called Fish Creek. Day in and day out year after year, I tramped west to the Sarcee Indian reserve and east to where the stream emptied into the Bow River, learning every fish-holding pool and riffle. I came to know its waters so well that I could tell other fishers where they could place their lures within 6" of a trout. Now a soft spoken, earnest young man, Nick has that kind of intimate knowledge of his own home streams. The tip I'd like to pass along comes from Nick. There are over 120 steelhead streams on Vancouver Island. These are anadromous fish and thus migratory, in the river to ripen and spawn before returning to the ocean. One of the most consistent, year round techniques is fast water bobber fishing. The rig is adapted to take advantage of a float to indicate a bite, a weight to put the lure on the bottom, angling technique and fish behaviour. The gear we used is quite specific. The rod and reel of choice are a 10 �' Shimano 1051 and a Shimano Calcutta 250 levelwind with 120 yards of 12 - 15 lbs. backing. Use 18" of 10 -12 lb. leader to aid breaking off snags. At the gear end of the mainline (See pic), a 6" foam float is slid into place 6' above a small, No. 12 simple swivel. Prior to the swivel being tied on, the mainline is inserted through one eye of a second No. 12 swivel. To this swivel, a piece of surgical rubber tubing is secured to its second eye with a knot at its waist. The purpose of the second swivel is to allow the weight to slide up and down the main line. 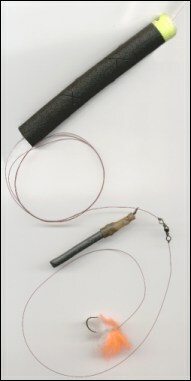 One - two ounces of lead pencil weight is inserted into the rubber tubing and it bumps along the bottom as the current carries the rig down a fast riffle. Below the mainline swivel add 18" of leader. The lure end is so deceptively simple, that it is, well, simple. A 1/0 - 2/0 single, barbless, steelhead hook (octopus style) is tied to the leader with a sliding hook knot (steelheaders call this a wool knot). A loop of line is forced through the eye of the hook and 1"of colourful synthetic yarn - yellow, hot green or hot pink - is inserted. Finally, pull the line snug. This small lure, with perhaps a single pink egg and scent represents a salmon egg that has come free from a spawning bed redd. Now comes the technique part. A neophyte in the use of levelwind reels, I immediately created a bird's nest backlash. Patiently untangling each one, Nick mildly suggested greater thumb pressure on the reel. Then, cast after cast, I became less of a lethal weapon to surrounding anglers. As my halting skill increased, I came to admire the casual finesse of Nick's cast. And then I suddenly understood the cast and retrieve technique. The lure is cast slightly above the angler and allowed to drift down the riffle. The point is to keep the rod tip, the float and the weight in a straight line, thus telegraphing a strike so the hook can be secured in the fish's mouth. The tip is held high, line metered out with the thumb as the rig sweeps past the angler and contact is maintained through semi-taut line. The final ingredient is an understanding of steelhead behaviour. Unlike resident fish, steelhead often do not take up a position and hold it. They are on the move. They also prefer fast water, or the very small slicks of slower water adjacent to white water. They bite out of aggression rather than for consistent feeding purposes. Accordingly, while resident fish would be more likely to be taken at the head of a pool or at its tail, and be actively feeding, steelhead fishing often improves where streams narrow, thus funneling moving fish through narrow sections of fast water. In other words, resident trout and steelhead often bite in different sections of the same stream. Consider the previous paragraph only a very quick summary. Winter steelhead, for instance, often won't budge an inch. They can be so stuffed with eggs they won't go after anything that doesn't hit them on the nose. When fishing with artificial lures in the summer try to pick sections of the stream where fish don't get a good look at the lure and have to bite in an instant as the lure sweeps by. As the day progressed, I became greatly impressed with Nick's skill as an angler and ability to catch fish. If you'd like to reach him and book a day's fishing, phone 1-250-723-0136 , or send an email to GentlemenPreferBlondes@bc.sympatico.ca . He's very knowledgeable about his home territory. Treat yourself to a night at Jack's; it is definitely the kind of place your wife would feel pampered while you spend the day shooting adrenaline through your system within view of your room. Can't beat that.